OUR EPHEMEROPOLIS POSTER IS HERE! On July 3rd this year, on the back of our 2019 theme being announced – it’s ‘Ephemeropolis’ by the way, and you can find out more about that glorious description of our temporary city right here – we called out for poster designs from our prolifically talented community. Wouldn’t you know, we started getting an avalanche of ideas and submissions almost right away, and the level of submissions was right up there – making it quite a challenge for our team to choose a leading design. 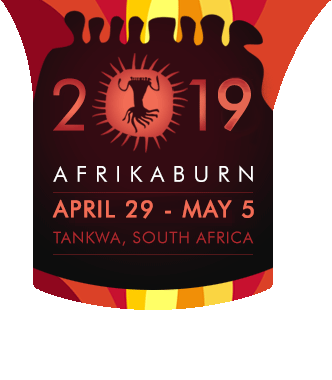 The criteria that went into selection was along the lines of ‘Does it faithfully communicate the concept of our 2019 theme?’ and ‘Would someone who knows little about AfrikaBurn be able to get a sense of the event, and theme, through the graphic?’. We’re happy to announce that the process of selection is now done & dusted, and we have a clear winner! Citizens of Tankwa Town, please put your hands together and welcome our glorious 2019 poster design, by the rather talented Camille Tindogan! As you can see, the various elements that make up a combination of Tankwa Town and the Ephemeropolis theme concept (ie: a temporary city that rises for a short while, and then disappears) are all in place, wrapped in the neat format of an hourglass, through which desert sands are pouring. Massive congrats to Camille for nailing it! We’ll be printing the poster soon, and will be giving it away for free (as always) at our Streetopia event on December 1st in Cape Town and elsewhere, including in Tankwa Town in 2019 at our Gate, and also at Off-Centre camp. But if you’d like to get your own copy now, you could always click the image above to download a hi-resolution version and print your own. pssst: if you’re an art lover (which is likely, considering you’re here) and you’d like to check out our past posters, head over to our Archive page, where you can browse, and download, all of our past posters & event guides.